Good morning polished world! Hope you're all having a good start to your week!!! It is very chilly here, which is a drastic change from last week. I kid you not, this time last week it was 80 something degrees. Last Wednesday I think the high was 92 degrees. After the cold front came through though, our temperatures dropped and it was goodbye shorts and tshirts, and hello jeans and hoodies. So it seems that Fall is officially here. Another reason I know Fall is here is because the outdoor lighting is getting funky. Typically in the summer I would take my outdoor photos around 3:30pm and I would get the clearest photos. Now, it's getting darker earlier, meaning I need to get my booty out in my front yard sooner to take nail photos. This was one of those manicures where I wish I got outside sooner to photograph but of course was working and couldn't. It really was quite gorgeous in person, just the lighting is all off and I'm not 100% happy with the photos. 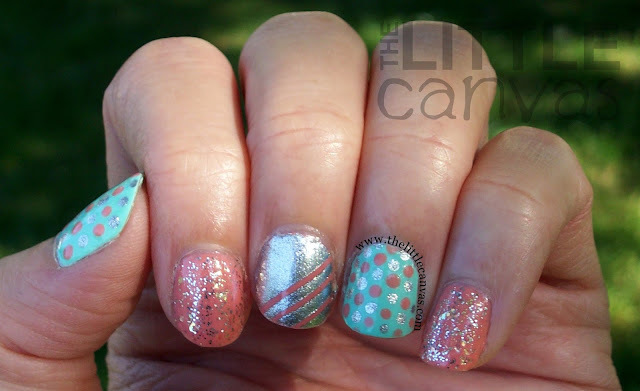 Let's take a look at the random Peach and Mint Kitchen Sink manicure! Regardless of not getting it to photograph it well, I still loved this manicure. I usually do not wear light pastel colors like this, so it was a nice change of pace from the neons, purples, and blues. On the plain Orange Cream nails, I did two coats of this gorgeous Sinful Colors polish. When the Sugar Rush Collection came out, I was unsure of this polish as I thought it was really close to Luminary which I purchased last year. After seeing that Luminary had a heavy shimmery to it, I went back and purchased Orange Cream on sale. It was a good purchase since it really is a pretty color. I then added a coat of China Glaze Make a Spectacle which was from last years Halloween Collection. I really do not think I have used this polish yet, and I'm not sure why I haven't since it is quite amazing. 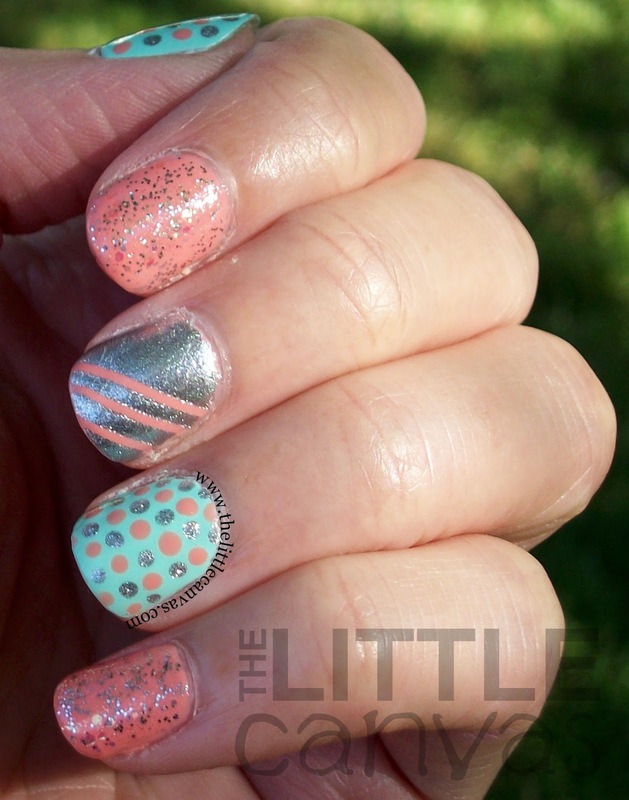 It reminds me of Essie Shine of the Times but not in Flakie form. I didn't have the desired look though from just using that glitter alone, therefore I went back through and added a plain silver glitter polish. On my ring and thumb, I did three coats of Mrs. Mint by Funky Fingers. This polish can be a tad streaky, but I do enjoy it. It's worth the effort it takes to sometimes put it on. I then added orange and silver dots using Orange Cream and Celeb City. I then had a plain silver nail on my middle finger but I wanted something with more umph. I removed that nail and put on a base coat of Orange Cream. When it was completely dried, I added three pieces of nail art tape and painted a coat of Celeb City on top. I quickly removed the tape and really liked the end result. What do you think? Like this kitchen sink manicure? Think it's weird to do pastels in the Summer/Fall?